The macros in this article will insert a specific signature file into a message. strSigFilePath = enviro & "\Microsoft\Signatures\"
.Subject = "Subject goes here"
If you need to change a signature in a reply, you will need to remove the signature that was added automatically and insert a new one. If you are creating a new message or not keeping the message body, you can insert an HTML signature directly into .HTMLBody. This macro removes the default signature and adds a new one. After using this macro, the signature bookmark is removed and you will not be able to change the signature automatically. You will be able to insert another signature manually. 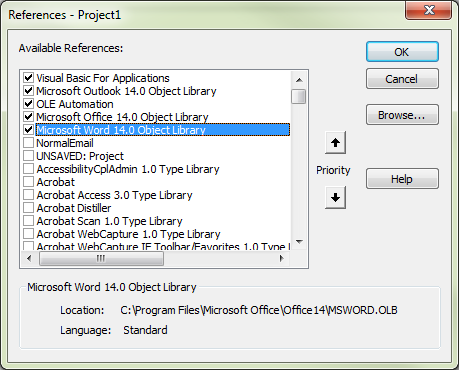 You will need to set a reference to the Microsoft Word Object Library in Tools, References. Set a reference to the Word Object Model in the VBA editor's Tools, References dialog. Can you guide me on how can I use the text before the current email's auto signature bookmark? I am trying to search for a keyword "follow up" in my current reply, to trigger a macro for setting a reminder. It is important to only search the text in the current reply (before the auto signature) to verify whether the keyword exists, and only then trigger the macro else, do nothing. was looking for something like this and found a VB script instead that creates new signatures and makes it the default. pretty basic but you can insert company logo. is it permitted to post here the code? the original author is still there mentioned in the code. Yes, you can post it here. 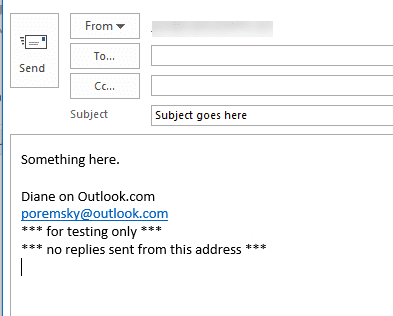 As a demo for UIAUTOMATION, its good - and could be very useful to do other things in Outlook. I tried running this macro in Outlook 2016 and it will not run "Compile error: User-defined type not defined." You can edit the code to use late binding (which will avoid the need to set the word object model), but not all word features will be available if you do this - in the macro no this page, specifically the few lines that set a border will error.